The biggest shopping season of the year is approaching, and with it, plenty of expectations. Customers want to see quality products, worthwhile promotions, and packaging befitting this joyous time of the year. So, you’ve got your work cut out for you, especially on that packaging front. Thankfully, with some careful planning and insightful choices, you can style your holiday packaging in the manner that fits you best. Whether you add in a few holiday colours, or completely overhaul your packaging supplies, you’ll create holiday unboxing experiences that’ll make customers take notice. Though we cover e-commerce packaging quite often, these suggestions work for both online businesses and those physically planted in a mall. After all, showmanship is possible whether you’re in the room with a customer or halfway across the country. High-end retailer Tiffany’s is well-known for intentionally packing up a purchase in full view of a customer, and hand-tying their iconic white ribbon in a showy flourish. Run with that. 1. Work with what you’ve got. 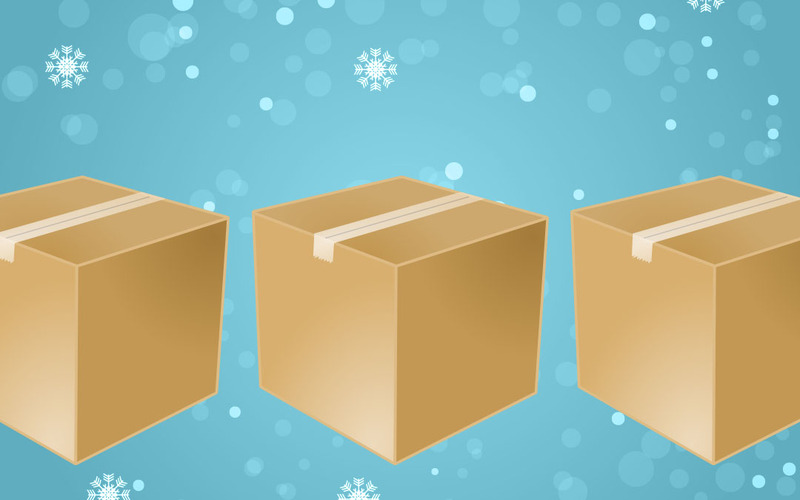 The easiest way to create holiday unboxing experiences is through a few simple substitutions. Crinkle paper is a great alternative to kraft paper sheets. It conjures up a desire in customers to dive their hands into a crinkle-filled box to retrieve their purchases. Go for the Christmas mix if you’re really feeling the season, but know that the texture of crinkle paper automatically makes your branding colours feel festive and holiday-appropriate. Tissue paper is yet another great alternative to kraft paper sheets. All those soft, crinkly and wrinkly, semi-transparent sheets add a touch of class and quality to any products wrapped up in them. All it takes is a mix of green, red and white sheets, and your customer’s holiday unboxing experiences are guaranteed. Wrapping paper is usually offered for items being gifted later. But, there’s no reason a customer can’t receive their own purchases wrapped just as nicely. Sure, they paid for them, and know what’s inside, but they’re not immune from the feeling of unwrapping a gift and unboxing a package. It’s yet another holiday win for you. 2. Add a few custom packaging options. Just a piece or two of custom branded packaging can send your holiday unboxing experiences soaring. Custom labels are an easy way to pull everything together. You can use holiday symbols like mistletoe, snowmen or candy canes, deck your logo out in holiday colours, or simply keep your logo as-is. Whether your boxes are kraft or printed, your tissue standard or branded—one custom label is all it takes to say every piece of packaging here belongs to your brand. Custom tissue paper takes that classy, quality feeling of standard tissue paper and dials it up to 11. And, much like custom labels, whether you use holiday symbols, colours or messaging, or stick with your own branding information, your business still wins. You’re creating holiday unboxing experiences and customers won’t forget your efforts. TPC Tip: Make that stack of custom tissue paper go further by using standard tissue paper sheets (preferably colour-coordinated) to pad out your packaging. Custom wrapping paper is an unusual and unexpected offering—and that’s what makes it so memorable. It’s yet another opportunity to celebrate the season, exalt your brand, and wow your customers. It’s something they’ll want to show everybody. 3. Go fully custom with your holiday packaging. Adding custom colour boxes, custom printed mailers and custom packing tape to your branded packaging will make you a star, not only to your customers, but your competition as well. Just be aware, this avenue certainly takes more of everything—time, money and planning. But done right, the results can be astounding. Whatever tactics you choose to pursue for your holiday unboxing experiences, think carefully about your business, your goals, and your budgetary limitations. Outstanding presentation, without consideration for your bottom line, won’t get your business very far in the long run. Wish everyone a very merry holiday season. No matter what, never forget the customer. You’ve got to say thanks and let them know how appreciated they are. Thankfully, that’s not a difficult proposition. A big and bright postcard, a heartfelt greeting card (we’re partial to funny and clever! ), a few discount coupons, or just a pile of mini candy canes. Any one of those inserts will make customers smile, and ensure they come back again soon. Here’s to a very merry holiday shopping season, and to all the holiday unboxing experiences that await your customers. Whether you need standard or custom packaging supplies, The Packaging Company is here for you.